Makes: Makes about 2 dozen bars. 1Preheat the oven to 350°F and butter a 9×13" pan. 2In a large bowl, beat the butter with both sugars at until light and fluffy. Beat in the eggs and vanilla. Add the flour, baking soda and salt and stir until almost combined; add the chocolate chips and 1 cup of the pretzel pieces and stir just until blended. 3Spread the batter evenly in the pan and bake for 20-25 minutes, until golden. In a small bowl or saucepan, melt the peanut butter and chocolate chips in the microwave or over low heat, stirring until smooth. 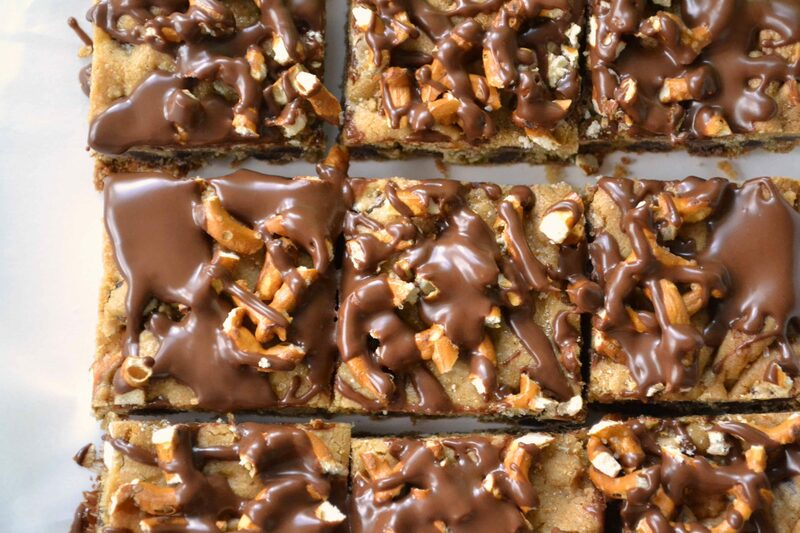 Sprinkle the bars with the remaining crushed pretzel pieces and drizzle with the peanut butter-chocolate mixture. Let cool until set, then cut into squares or bars.